Time for a Valentine project! This cute Love Bot Treat Box was created with Stampin' Up! punches, a paper cutter and a score board (or scoring blade). No fancy templates are used for this project. The overall dimensions are approximately 8 1/2" tall and 4" wide. The top opens so that you don't have to rip the box open to get the candies out. Full color step by step instructions for only $2.50. These is a digital class that is delivered via download. After completing payment, you will receive an email from Fast Wagon with a link to download the class. If you don't receive the email, please check your spam box before contacting me. If you plan on ordering classes from me in the future, you may want to add service@fastwagon.com to your address book to avoid spam filtering. Wishing you a good Sunday! OMG, Kim, this is absolutely adorable! A truly creative and great idea. Thanks so much for sharing it! I can't think of any words that haven't already been said other than this is amazing!! OMGosh...When I think you cant outdo yourself...YOU DO! LOVE IT! Kim.. YOU BLOW MY MIND with the creations you come up with!! 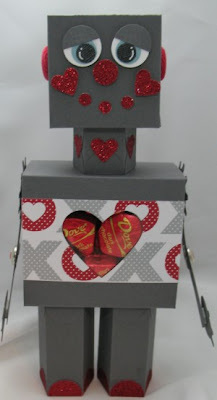 I love this robot treat box!! Awesome job! !